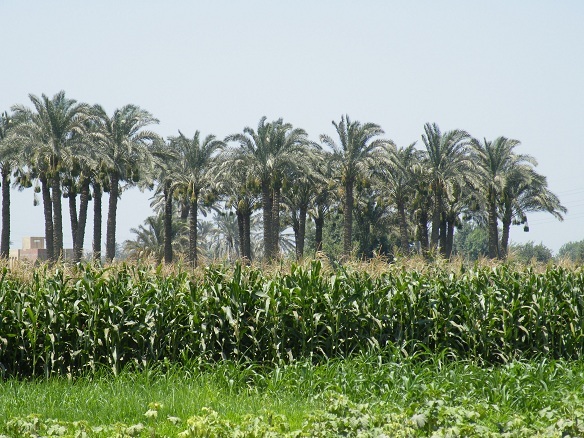 My original plan was to spend around 10 days in Egypt where I could travel along the Nile visiting date plantations and see something of the huge Egyptian date industry. At the time of booking my travel there was a lot of civil unrest with the revolution - which has subsequently ousted the president who'd ruled for the past 30 years. 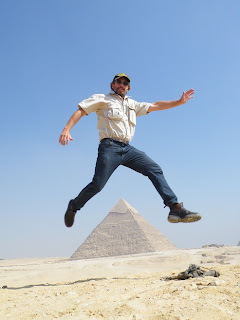 With the ongoing trouble and violence over several months I decided to minimize my travel to a day. 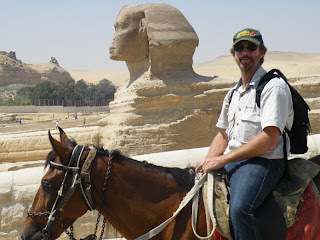 As a safety precaution I arranged for my hotel to pick me up from the airport as well as assign me a good driver who spoke English to drive me around Cairo. As it turned out, just a few days before my arrival there were new elections to elect a new president (with a victory margin of less than 1%) which marks an historic new chapter for Egyptian democracy. Street demonstrations, protests and military activity had settled right down and I probably could have extended my travel plans. 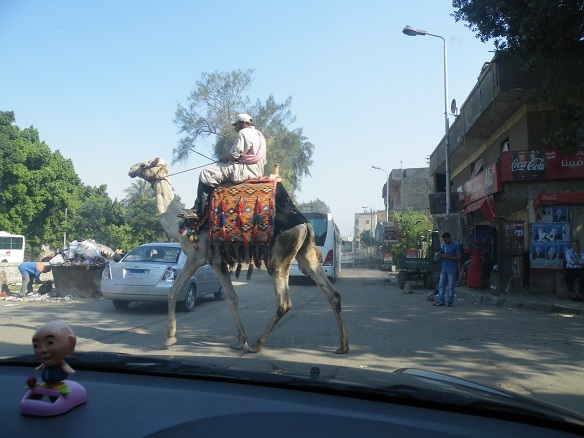 Traffic in Cairo is chaotic - just continuous tooting, motorists pushing in and dodging pedestrians, heavy all day and night, taking lengthy periods of time with many delays to drive relatively short distances and quite 'hairy'. 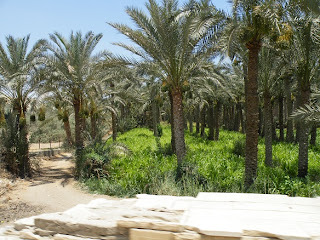 Driving around Cairo was fascinating with date palms heavy in fruit everywhere. 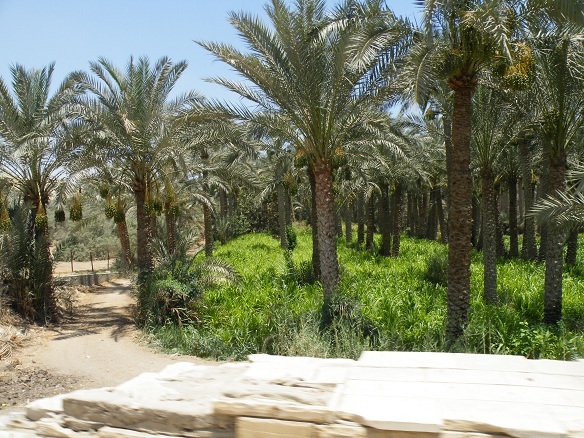 Date palms were being farmed on small blocks on the edge of the city. 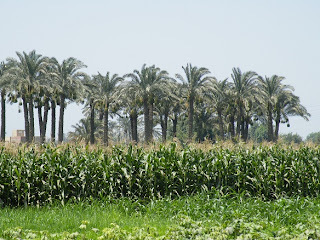 It was interesting to see the different crops being grown beneath the palm canopies - mangos, bananas, corn, cotton, vegetables and livestock, making for an attractive landscape. 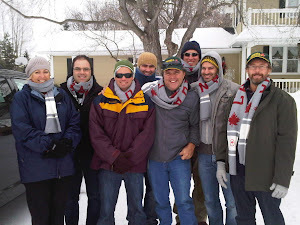 Also gave me a few ideas to implement back home. Of course when in Cairo the pyramids are a 'must see'. When I arrived I realized just how few tourists there were. I almost had the place to myself. The revolution has kept tourists away - which I didn't mind at all! The pyramids and Sphinx cover a large area (about 9km) and vehicles are not permitted to drive around them. 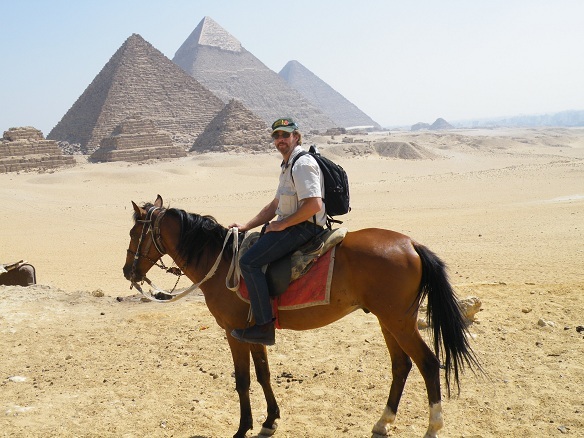 It is not practical to walk that distance in the soft, white, reflective sand in 40 degree temperatures so I hired a horse and rode around. 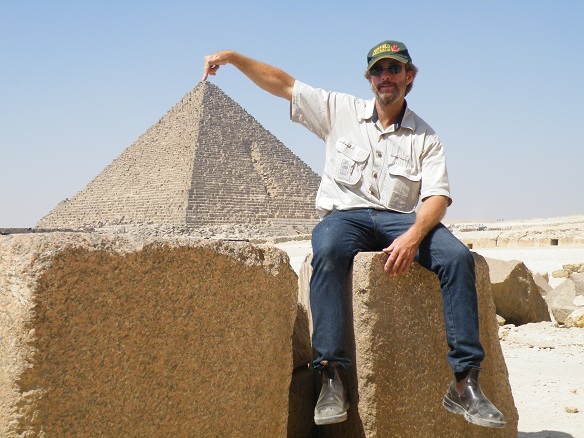 After watching so many doco's on TV over the years about the history of these 5000 year old pyramids and their stories, it was a great thrill to see them up close and connect with their history. Egypt was hard travelling but I'm glad I spent time here. Although I didn't get right into the date cultivation side of things I still compiled some good notes on the mixed/inter-cropping farming systems.